The Comp 9 Air - if you didn't believe that playback of music from your smartphone or tablet would be sufficient for audiophile sound, we would like to show you the contrary! Air not inly means wireless, Air means a completely new approach to the HiFi / HighEnd topic. This unique concept reduces the hardware requirements to a minimum. 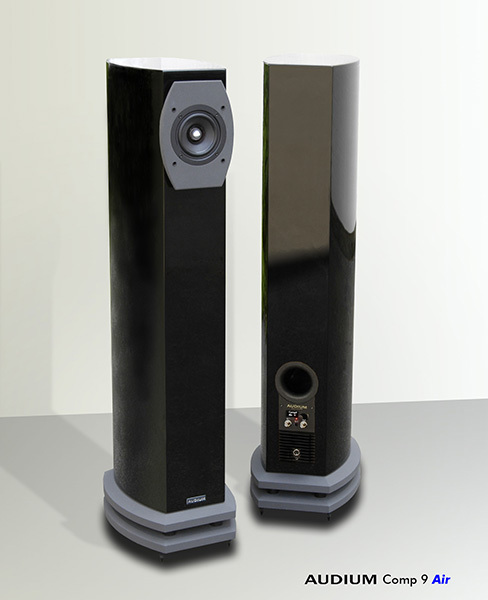 All you need is a pair of AUDIUM Air speakers. No Audio-Sources, Players, Pre-/Power- or integrated amps are neccessary any more. Music is being transmitted to the loudspeakers from your computer, tablet, smartphone or any cloud-app via WiFi (UPnP/DLNA and AirPlay® compatibe). Or through the coaxial or optical Toslink Input (both up to 24/192k) at the Master loudspeaker. The master then outputs the music signal through its digital output in full resolution to the slave. The processing of the audio signals is done completely in the digital domain - from the source, up to the digital power-amp which forwards the amplifier signals into the fullrange driver / woofer. Completely without any passive components of changes between digital and analogue domains with maximum resolution, and no losses. Also volume control is done digitally, but with a calculation accuracy of 48 Bit (!). A resolution that will break any argument against a digital volume control! This is all done by the amplifier module which has been developed by AUDIUM . It drives the 4" fullrange driver with whisler cone and active phase-plug as well as downfired 9" woofer. The integrated DSP replaces a classical crossover network and allows various adjustments of the loudspeakers to your listening room and your personal audible demands. The holographic reproduction, fine dynamics and resolution of our fullrange driver, combined with the deepest bass fundament of the downfired sub will excite you for sure. And you will re-discover your music collestion in a completely new light! The Comp 9 Air from AUDIUM - ahead of the times!